I have been on a pasta making spree. It all started when I spied the leftover dumpling wrappers from my Daring Cooks October Challenge of wontons, in my freezer. I hadn't used many for the challenge and I was looking at an almost full case of them. With the freezer door open, I continued to stare at the package for a good five minutes before inspiration struck. I had some ground chicken as well and I stared alternately at that and the wrappers and finally, a bulb went off; Dumplings!!! I simply love dumplings and we frequent this place called, Mandoo Bar, in Korea town to satisfy our cravings. We literally 'pig' out there!! They are so light and comforting! How can one not?! Ok, that's how it started. By the time, I was set to make them, I changed my mind to make a heartier meal and decided to do stuffed pasta with sauce than just steamed dumplings. And, so it was served - Chicken Ravioli with Puttanesca Sauce.. The chicken filling I made would be fantastic for a dumpling as well. 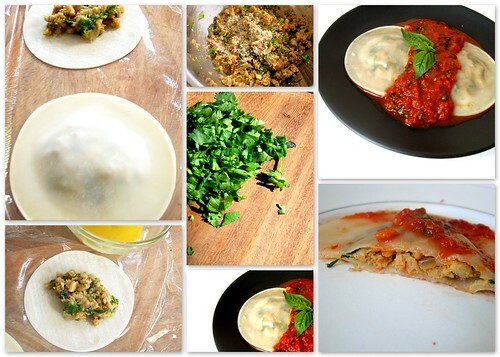 So, if you decide to go that route, skip the sauce, change the shape of the wrapper, steam or saute and you are all set! Before you go, I wanted to remind you about the Book Giveaway, I am hosting in celebration of my 100th post; 4 days left to participate. For details, check out the Giveaway post..
Brown the chicken meat in a little oil. Add in the onions, garlic, and ginger and saute untill the water has evaporated and the onions are soft. Mix in salt, pepper, paprika, worscestershire and pimento sauces and cook until the meat is fully cooked. Remove and cool to room temperature. Add the beaten egg, bread crumbs and chopped cilantro and combine to mix well. Check for seasoning and adjust if needed. Refrigerate the filling until ready to use. Heat oil in a large saute pan and cook the anchovy for a minute. Add in the onion and garlic and saute until soft. Sprinkle rosemary and thyme and stir for a minute till you can smell the herbs. Add the tomato paste and crushed tomatoes, cover and cook for 5 minutes. Stir in capers, oregano and sage. Season with salt and pepper. Add the stock. Bring to a boil and then simmer on medium low until the sauce has thickened. Remove from heat and stir in basil and parsley. Bring a large pot of salted water to boil. Place one wrapper on the working surface and cover the rest with a damp towel. Place a rounded teaspoon of the filling in the center and pat down. Brush the edges of the wrapper with water. Place another wrapper over, press and seal. Ensure that there are no air pockets, else it will break apart while cooking. When ready, reduce the heat to bring the water to a slow simmer with no angry bubbles. Add 2 or 3 raviolis at a time. They are done when they float to the top. Let them float for 20 secs and then remove. If they seem to have trouble floating to the top, add a few drops of oil to the water and gently pry them from the bottom using a slotted spoon, taking care to not rupture the skin. Place them in a pan that is lightly coated with the sauce, to prevent them from sticking to the bottom and keep them warm until ready to serve. 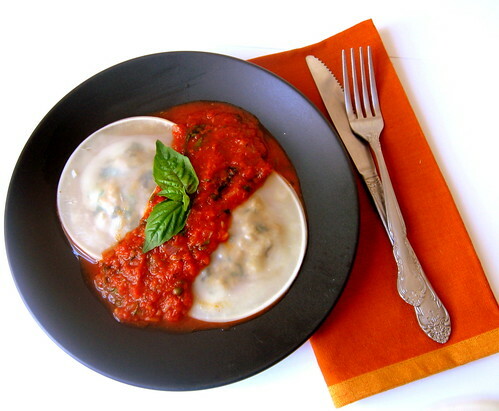 To serve, make a base of the sauce, arrange the ravioli on it and top with more sauce and garnish with a sprig of basil and grated parmesan.